Sources from within PC players told DigiTimes on Tuesday that "several first-tier" PC vendors are readying Thunderbolt-equipped motherboards, notebooks and desktop computers for release. Sony and Asus are expected to adopt the new technology, while Gigabyte technology will reportedly launch a Thunderbolt-capable motherboard in April of next year. According to the report, Intel cooperated with Apple exclusively this year in order to "speed up the standardization of Thunderbolt." As interest in the technology has continued to grow, Intel has readied the technology for "public use." Thunderbolt should see even further adoption in the second half of next year as related costs drop. Sources told the publication that the technology will be "standardized gradually in the future" as chip prices fall. In June, Sony was originally thought to have developed the first non-Mac Thunderbolt PC with its VAIO Z laptop and Power Media dock. However, it was later revealed that the company had used an early version of Intel's technology that did not match the Thunderbolt standard. Apple partnered up with Intel to unveil the Thunderbolt I/O in its MacBook Pro lineup this February. The Mac maker quickly added the technology to its products, including the iMac, MacBook Air, Mac Mini and LED Display. 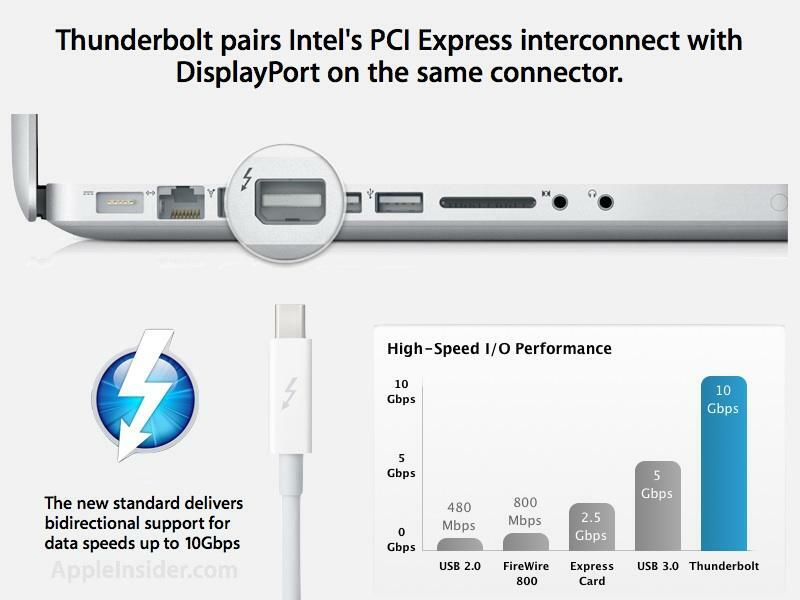 Thunderbolt combines Intel's "Light Peak" specification with Apple's Mini DisplayPort to support transfer speeds of up to 10Gbps. The technology uses the PCI Express standard, allowing for a range of peripherals and functions. The first Thunderbolt peripherals, such as RAID systems and external drives arrived on the market throughout 2011, but high costs have reportedly been a barrier to companies looking to make Thunderbolt accessories. For its part, Intel claimed earlier this year that Thunderbolt has attracted "tremendous response from the industry," touting more than twenty companies, including Belkin, Canon, Seagate, Western Digital and Adobe, interested in adding Thunderbolt support to their products. Also affecting Thunderbolt adoption is the growing presence of USB 3.0. HP, the world's largest PC maker, has decided to go with USB 3.0 after not finding a "value proposition" with Thunderbolt. Intel has said it will support USB 3.0 alongside Thunderbolt, which is meant to be "complementary," but some PC industry insiders have claimed that Thunderbolt could "greatly affect" adoption of the competing standard.